In the spring of 1814, Napoleon Bonaparte was defeated. Having overseen an empire spanning half the European continent and governed the lives of some eighty million people, he suddenly found himself exiled to Elba, less than a hundred square miles of territory. This would have been the end of him, if Europe's rulers had had their way. But soon enough Napoleon imposed his preternatural charisma and historic ambition on both his captors and the very island itself, plotting his return to France and to power. After ten months of exile, he escaped Elba with just of over a thousand supporters in tow, landed near Antibes, marched to Paris, and retook the Tuileries Palace--all without firing a shot. Not long after, tens of thousands of people would die fighting for and against him at Waterloo. Braude dramatizes this strange exile and improbable escape in granular detail and with novelistic relish, offering sharp new insights into a largely overlooked moment. 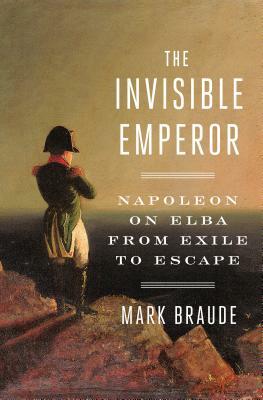 He details a terrific cast of secondary characters, including Napoleon's tragically-noble official British minder on Elba, Neil Campbell, forever disgraced for having let "Boney" slip away; and his young second wife, Marie Louise who was twenty-two to Napoleon's forty-four, at the time of his abdication. What emerges is a surprising new perspective on one of history's most consequential figures, which both subverts and celebrates his legendary persona. The Invisible Emperor is both a riveting story and an original examination of how preposterous, quixotic, and grandiose ideas can suddenly leap from the imagination and into reality. Mark Braude has been a postdoctoral research fellow and lecturer at Stanford University and was named a 2017 Public Scholar by the National Endowment for the Humanities. His writing has appeared in The Globe and Mail, The Los Angeles Times, and The New Republic. His first book, Making Monte Carlo: A History of Speculation and Spectacle was published in 2016. Mark lives in Vancouver with his wife.